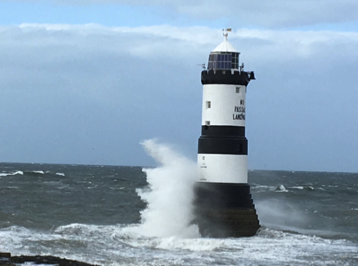 Day 2 of our Anglesey adventure saw us doing a 10 mile coastal walk from Amlwch to Cemaes, the weather stayed dry but the wind was blowing at 50mph making it hard going. It was a lovely walk seeing copper mines and churches. The paths are some of the best kept we have ever seen. The 200-kilometre (124 mi) coastal path mainly follows the coast. Exceptions are where the path comes inland from Moel y Don by Plas Newydd estate, and the Bodorgan Estate on the west of the island between Aberffraw and Malltraeth, where Prince William and Kate (Duke and Duchess of Cambridge) used to live. Its a ten mile moderate walk in total with a fair bit of ups and downs but is not that hard a walking I would allow about 5 hours due to stopping numerous times to have a look about and take photos along the way. You will be able to download the GPS file for mapping out this route below, also its best to leave the car at Cemaes and catch the bus to Amlwch. You will need to number 62 bus from outside the fish and chip shop on the high street, It cost £2.50 for a single journey. After an hour and a half delay we finally set off on our Dublin trip. Travelling across a stormy Irish channel on one of the coldest days we have ever known. I wasn't sure if having the large fried breakfast before we set sail was the wisest decision, but only time would tell. As it happened no sickness occurred and after another delay of ½ hour disembarking we finally reached Dublin city. Because of the delays we only had around 3 ½ hours to look around so decided to take an open top bus tour. This enabled us to see the major tourist attractions and the Irish bus driver was very entertaining. After the bus tour we had to have a pint of Guinness so found a very atmospheric Irish pub called Madigans, I didn't mind the taste although the wine went down much easier. After this we looked round the temple bar area of the city before making our way back to the bus stop. The ferry journey back went without a hitch and after watching them dock the ferry we made our way back to the hotel. 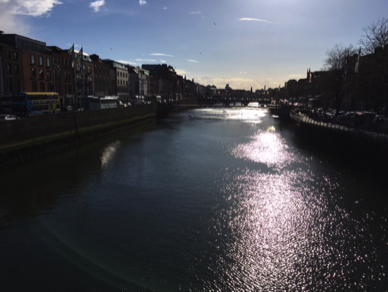 Dublin was a lovely city and we would love to go back to Ireland. 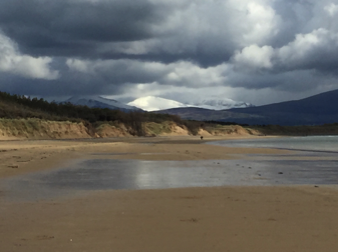 Anglesey was a mixed bag of weather we had everything from hail, snow, wind, rain then finally sun. Our first stop was the Menai bridge and a lovely walk to church island a very beautiful and poignant church and graveyard. The Menai Suspension Bridge (Welsh: Pont Grog y Borth) is a suspension bridge to carry road traffic between the island of Anglesey and the mainland of Wales. The bridge was designed by Thomas Telford and completed in 1826 and is a Grade I listed building. 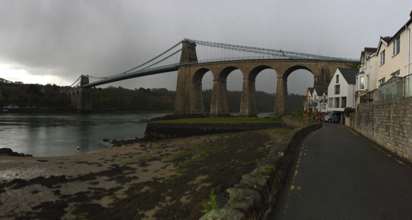 Church Island (Welsh: Ynys Dysilio) is a small island in the Menai Strait on the shores of Anglesey to which it is attached by a short causeway that is reachable only on foot off the Belgian Promenade. The whole 2.7 acres (11,000 m2) of the island is taken up with St Tysilio's church, constructed in the 15th century, and the churchyard. The 20th-century bard Cynan (Albert Evans-Jones) is buried in the churchyard. The Anglesey Coastal Path passes the head of the causeway. Plas Newydd house and gardens is a National Trust property and was our next stop, between snow showers and glorious sun shine we explored the house and garden. Plas Newydd is a country house set in gardens, parkland and surrounding woodland on the north bank of the Menai Strait, in Llanddaniel Fab, near Llanfairpwllgwyngyll, Anglesey, Wales. The current building has its origins in 1470, and evolved over the centuries to become a one of Anglesey's principal residences. 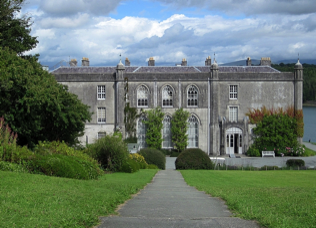 Owned successively by Griffiths, Baylys and Pagets, it became the country seat of the Marquesses of Anglesey, and the core of a large agricultural estate. The house and grounds, with views over the strait and Snowdonia. Inside the house was a Waterloo inspired military museum, many works of art and a Rex Whistler landscape mural. Gail managed to take a photo of one of the resident red squirrels. Llanddwyn island - By early afternoon we made our way to Newborough beach a beautiful place we had seen on a TV program, car parking cost £4 and was well worth the money. The beach is long and sandy and leads to a place we were calling love island but was really called llanddwyn island . The backdrop of this beautiful place was once again the lovely snow covered Snowdonian mountains. The island is tidal and can't be reached at high tide. On the island is a church ruin, a lighthouse some cottages and 2 crosses one very old and one Victorian. The scenery was stunning and made for a lovely walk. We also spotted a seal in the sea. The island is very rich in legends, and in particular the association with Dwynwen. The name Llanddwyn means "The church of St. Dwynwen". Dwynwen is the Welsh patron saint of lovers, making her the Welsh equivalent of St. Valentine. Her Saint's day is 25 January and is often celebrated by the Welsh with cards and flowers. The remains of St Dwynwen's Church can be found. On the last day of our holiday we were meant to go on a boat trip round Puffin island but this was cancelled due to bad weather. So instead we set off to Penrhyn castle in Bangor north Wales another National Trust property. This beautiful house is set against a backdrop of the Snowdonian mountain range and has very extensive grounds, however we did not look around the gardens as the weather was so bad. It also houses a steam train museum which was good to look around. The house itself contains around 296 rooms. We first did an extra tour into the roof void, which was very interesting and showed how the house was constructed. 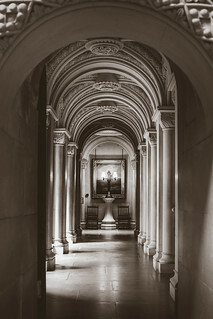 The rooms are very luxurious and contain many works of art, a slate bed created for queen Victoria when she came to stay, and a gothic stairwell. It was probably one of the grandest houses we have visited. Although as usual we liked looking round the kitchen and many pantries and servants quarters. 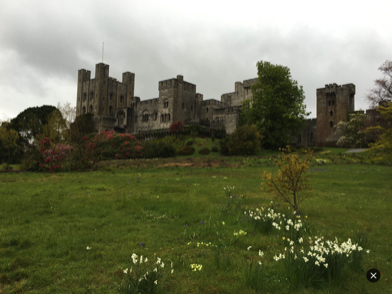 Penrhyn Castle is a country house in Llandegai, Bangor, Gwynedd, North Wales, in the form of a Norman castle. 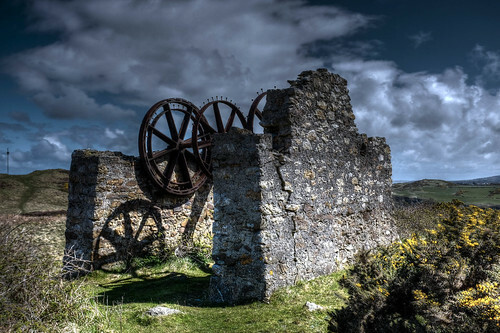 It was originally a medieval fortified manor house, founded by Ednyfed Fychan. In 1438, Ioan ap Gruffudd was granted a licence to crenellate and he founded the stone castle and added a tower house. Samuel Wyatt reconstructed the property in the 1780s.